The paper is available on the PNAS site and it is open access. 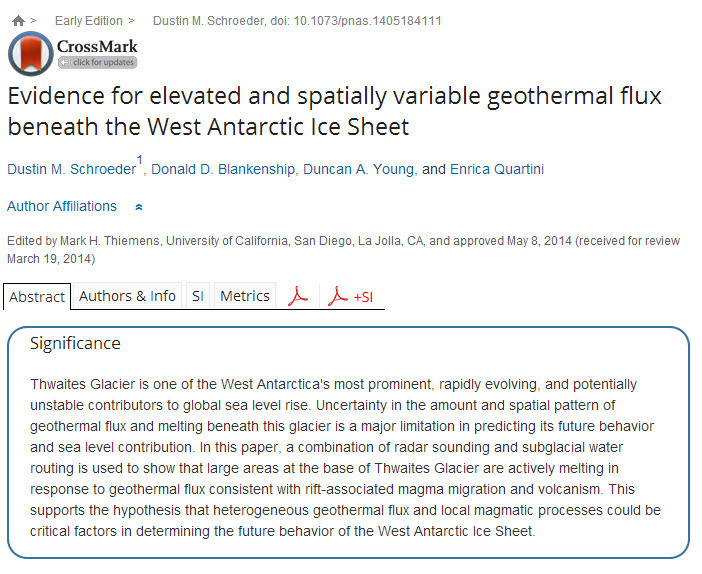 Schroeder and colleagues use radio echo sounding to detect the bed of the glacier. They see water beneath the ice. 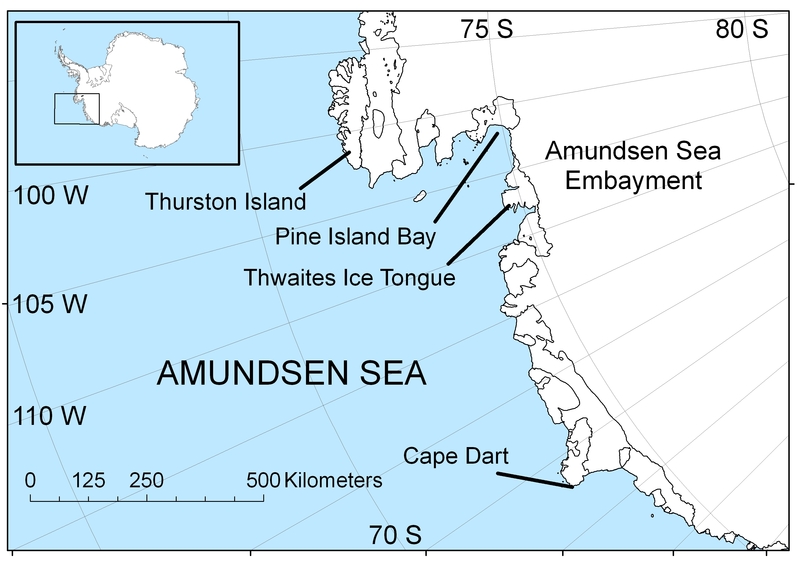 In 2013 they published a paper in PNAS interpreting these observations as a vast subglacial water system under West Antarctica's Thwaites Glacier. (There is a nice EurekAlert about the under ice “river” system). This is brilliant because not only did they show there was an active water system in 2013, but they are now using their data to understand the nature of the water system beneath the ice sheet. People tend to think “frozen” as stationary, and they can understand Antarctica as a static system – but in reality there are hundreds of under ice lakes like Vostok, There is - in places - extensive melting and refreezing of water going on under the ice – as pointed by out Robin Bell and colleagues in 2011. Plus the under ice “river” system Schroeder and colleagues identified in 2013. It is a very exciting time in polar research and I am looking forward to what this group publishes next. 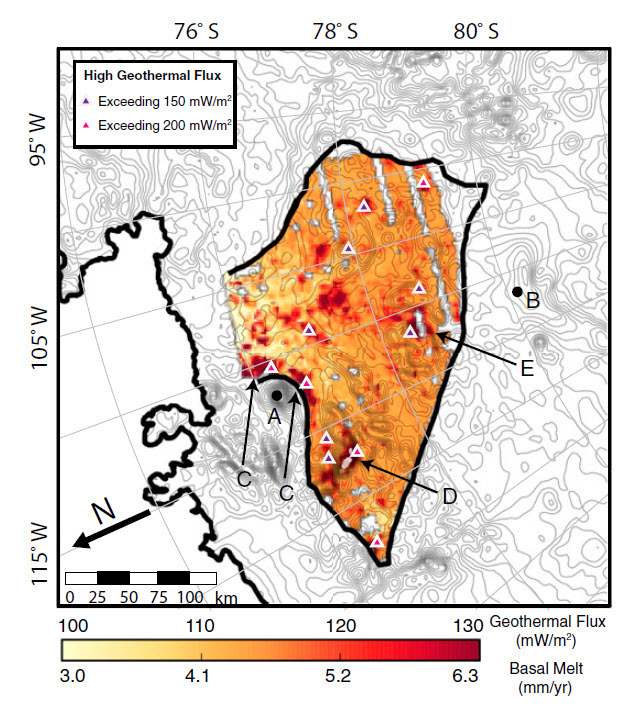 Schroeder and colleagues Figure 3 (above) shows geothermal flux (that is heat from the Earth) and a conversion to basal melt rates of the glacial ice. Their scale shows it goes up to 6 mm/yr. The picture below was taken from a preprint of Hofmann and Morales Maqueda (2009). 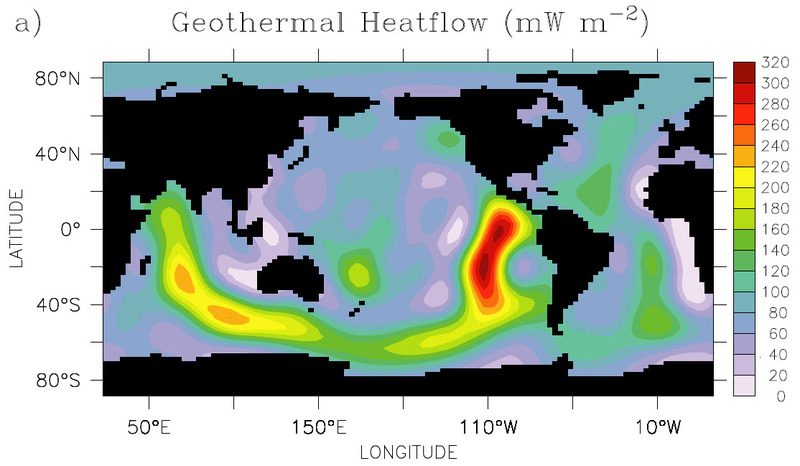 This picture shows the oceanic geothermal heat flow data from Pollack et al (1993). So Schroeder and colleagues derive a geothermal heat flow that is similar to that you find at the edges of tectonic plates – the brightest red in Schroeder and colleagues work (130 to > 200 mW/m2) is equivalent to green to yellow in the picture from Hofmann and Morales Maqueda (2009). But it is much bigger than the values in that region of the Earth in the Pollack et al (1993) data. 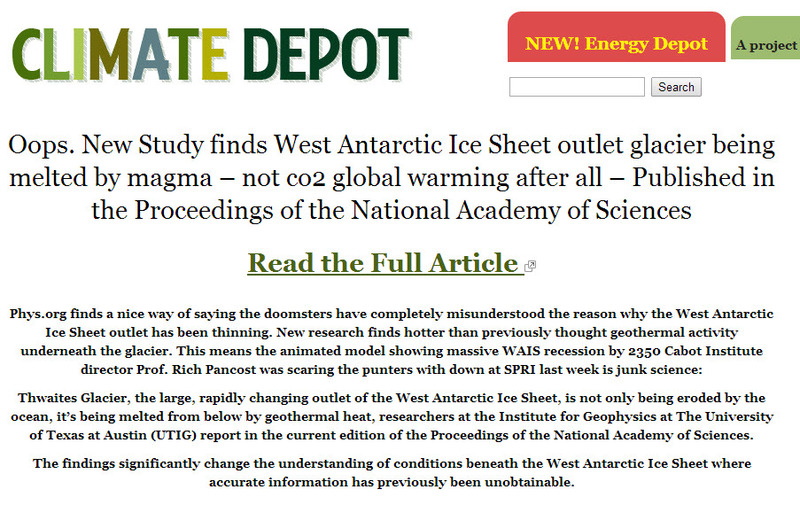 Is the geothermal heat significant for melting the West Antarctic Ice Sheet? Take Pine Island – which is adjacent to the Thwaites. Pierre Dutrieux and colleagues had this to say in 2013 of the basal melt rates. “At the broad scale [basal], melt rates of up to 100 m/yr occur near the grounding line [where the ice meets the ocean], reducing to 30 m yr/ just 20 km downstream [over the ocean]." So 100 metres per year from the ocean verses 6.3 millimetres per year from the geothermal heat. 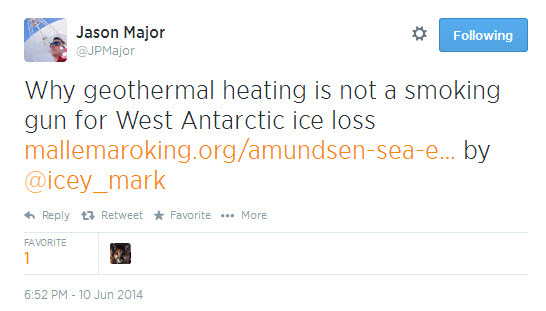 And the geothermal heat is clearly extremely variable in space. And if you want go one step further then Park and colleagues said that this basal melt rate due to the ocean was increasing at an accelerating rate of 0.53 ± 0.15 m / yr−2. Schroeder and colleagues work is, in my view, excellent and very significant. It demonstrates a hidden component for glacier hydrology. 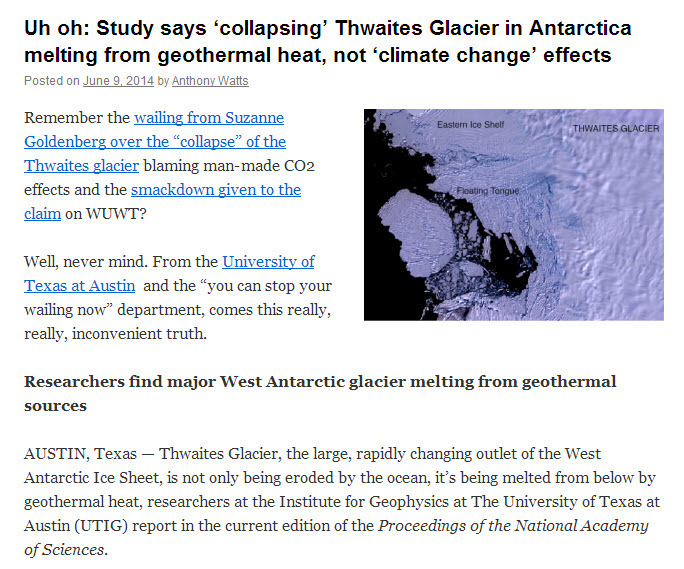 But it is not the reason for the observed melt of the WAIS. Are a very bad attempt of interpreting the significance of Schroeder and colleagues 2014 research. Dutrieux, P., D. G. Vaughan, H. F. J. Corr, A. Jenkins, P. R. Holland, I. Joughin, and A. H. Fleming (2013), Pine Island glacier ice shelf melt distributed at kilometre scales, The Cryosphere, 7(5), 1543-1555. Hofmann, M., and M. A. Morales Maqueda (2009), Geothermal heat flux and its influence on the oceanic abyssal circulation and radiocarbon distribution, Geophysical Research Letters, 36(3), L03603. Park, J. W., N. Gourmelen, A. Shepherd, S. W. Kim, D. G. Vaughan, and D. J. Wingham (2013), Sustained retreat of the Pine Island Glacier, Geophysical Research Letters, 40(10), 2137-2142. Pollack, H. N., S. J. Hurter, and J. R. Johnson (1993), Heat flow from the Earth's interior: Analysis of the global data set, Rev. Geophys., 31(3), 267-280. Schroeder, D. M., D. D. Blankenship, and D. A. 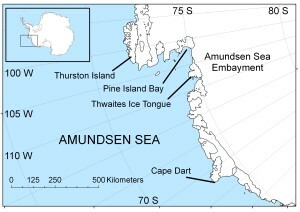 Young (2013), Evidence for a water system transition beneath Thwaites Glacier, West Antarctica, Proceedings of the National Academy of Sciences, 110(30), 12225-12228. Schroeder, D. M., D. D. Blankenship, D. A. Young, and E. Quartini (2014), Evidence for elevated and spatially variable geothermal flux beneath the West Antarctic Ice Sheet, Proceedings of the National Academy of Sciences, 111(25), 9070-9072.